MELLOTRONS, SAMPLERS, AND CONTROVERSY -- OH MY! Jerry and I had a 2pm rendezvous at Chez Doddy in western New Jersey, and we were right on time after driving the Interstate in the rain for about an hour. Fritz greeted us and introduced us to his wife Valerie, daughter Adrienne (an internationally ranked partners figure skater), and son Jake. Violet, a frisky Dalmatian, became our pal for the afternoon, but Rose, a Beagle puppy still in training, was content to gnaw on things in her crate. Fritz led Jerry and me to the third floor where Fritz's home recording studio, The Tree Fort, was waiting. Streetly refurbished Mellotron M400 #1697 was humming quietly, sitting under a Minimoog. 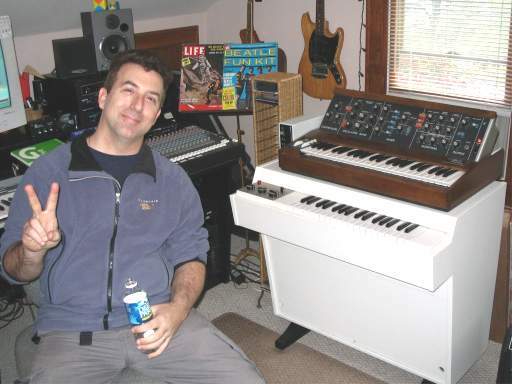 Fritz had other synths in his setup and some synth modules, two mixers, some effects, a MIDI patchbay, and Digital Performer running on a Mac. Fritz gave us a demo of a neat software package called "Live" (Ableton's Live, I think) that allows you to manipulate samples like MIDI notes and do a number of things that would be great for, well, "live" gigs. I took the opportunity to describe to Jerry how a lot of this works, remarking that with today's technology one can have a studio superior in many ways to studios of 20 years ago for a fraction of the cost--and they just keep making them better. Fritz's setup allows him to download projects from his workplace in New York City and work on tasks at home in The Tree Fort. Just in from Streetly was a brand new tape frame with--you guessed it--brand new sounds produced by Fritz! He has access to a number of professional musicians who were able to help put together some new sounds. Fritz climbed into a Yamaha piano with a guitar pick. The attack is sweet, and the sound has a real deep bass to it. "Wonderful depth and power," writes Fritz. This is a layer of alto flute, English horn, C flute, and oboe, with delayed vibrato. "...a beautiful pad sound." This is a split of two celli and two violini at an octave lower than the Mellotron fave 3-violins, played "con fuego." Martin Smith at Streetly agrees with Fritz that they "sound very 'tronny." After two years of carefully recording these sounds, Fritz was able to premiere them to Jerry Korb and me hot off the press from the UK---and you can hear them now, too, by clicking on the links above. Clear, in tune, and full of attitude, these sounds are now part of the Mellotron library and available from Streetly for your beastie as well, courtesy of Mr. Doddy's hard work!. Fritz informed us that "The Feeling of Far" doesn't have far to go. The album has gone way past the 4-track "teaser" that made the rounds a few years ago and as of April 2004 is nearly complete, awaiting a few tweaks. Fritz says that the 4 original tracks are there, but they fit much better in the context of the whole album, which takes on various tonal landscapes as it progresses. 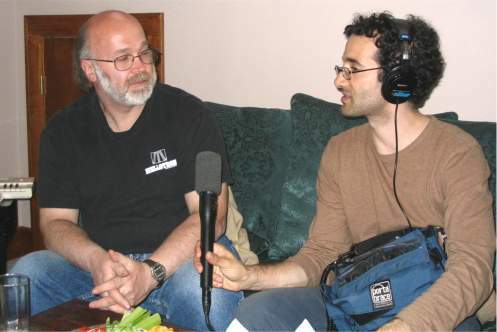 Jad Abumrad and his assistant Amy from WNYC (93.9FM in New York City) joined us at Fritz Doddy's house for an afternoon to chat about things Mellotronic. Jad produces a documentary type show for WNYC called "RadioLab." 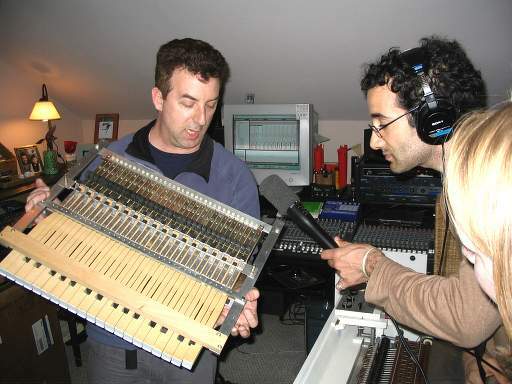 Jad's subject for this show was sampling, and he wanted information and stories related to the Mellotron---its history, where it is used, and where it is going. After all, the Mellotron was the first commercially successful sample player! ...and even gave a demo of how to change tapes. And the tape set he put in? His new one, of course, giving Jad and Amy the opportunity to hear the new sounds as well as the old, familiar ones. History buff Jerry provided a lot of the colorful Mellotron anecdotes from years gone by, starting with how Harry Chamberlin's ideas eventually gave way to the Mark I.
Fritz and his wife Valerie provided some libations and munchies, and we were chatting with Jad and Amy for a few hours. They seemed intrigued by the Mellotron and enjoyed hearing about its history and use in various albums. Often the questions turned to the controversy stirred by the Mellotron when it was introduced. Did it put musicians out of work? Were the unions angry? As a professional musician, Fritz was asked about his views on sampling, Napster, and the use of major portions of songs as some artists do today (an example being Thomas Dolby's "She Blinded Me with Science" being used as the rhythm track for a new hip-hop song---I heard it on the radio just the day before). Something I always admired about Fritz is what he considers to be music---he takes a very broad view of it, from classical violinists to turntable artists. Fritz figures that if you take tiny pieces of things and use them in a new and interesting way, that's not stealing. In fact, it makes him look at what was done and admire the creativity of it---the "gee, I wouldn't have thought to do it that way" of it. He talked about DJ Danger Mouse's "The Gray Album" and how it was a creation of the mix of Jay Z's "The Black Album" and the Beatles' "White Album". This type of creativity inspires Fritz because of its cleverness. Following the interview (Valerie had to come up and get us out of The Tree Fort so we wouldn't miss dinner) all of us went downstairs for a nice repast put on by the Doddys. Thank you Fritz, Valerie, Adrienne, and Jake for the hospitality and a great afternoon! 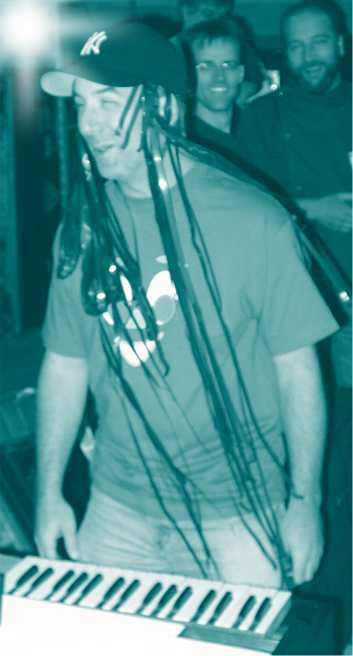 ...over Puff Doddy and the Tape Replayers' EDGY and HARD-HITTING LIVE album from 2001. Three years later, and it's a whole new era for PD/TR. They're exploring new musical ground, a dormant genre scoffed and ridiculed. But Puff Doddy and the Tape Replayers know how to give it that edge. 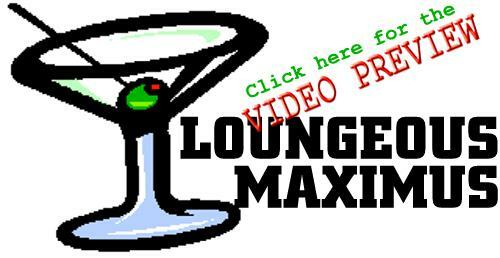 WOBBLY RECORDS is proud to announce the new release from Puff Doddy and the Tape Replayers: LOUNGEOUS MAXIMUS...Lounge music with an edge. Click below for a video preview (1:25, 1MB, Windows Media format). And this time they can go onstage with old ladies in the audience. In fact, it may be the only audience they get. "Puff" Doddy used the Mike Pinder Mellotron Sample CD---sorry, there was no Mark II handy in The Tree Fort. However that dog you hear isn't sampled---she's the real thing. And for the humor impaired out there: if you have been searching Amazon or asking at your local record shop about this one...uhhh...I really don't know what to say. You must already have a copy of the "Live" album and want more, huh? Thanks to Fritz for providing additional text, information, and sound samples for this page!